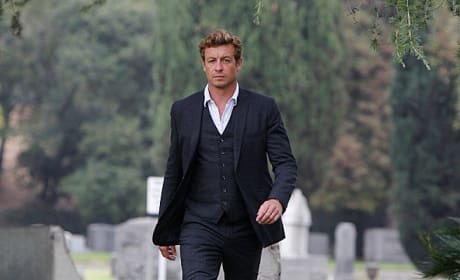 Patrick Jane was rarely seen without his three piece suit over the seven season of The Mentalist. It was his signature look with the vest, no tie and usually in shades of blue. Why? The color blue is believed to convey a warm and trustworthy feeling. 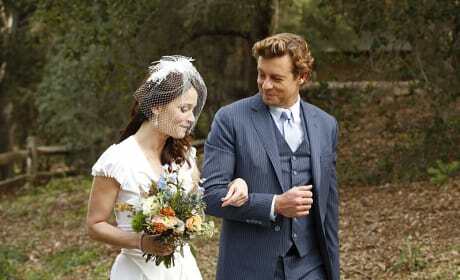 Getting people to trust him certainly made it easier for Jane to play his mentalist mind games…it also really brought out his blue eyes! 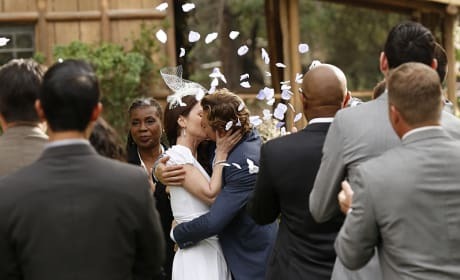 Let's just hope that Teresa and Patrick are able to celebrate their honeymoon without a serial killer chasing them on the series finale of The Mentalist. Oh my! Is that really Kimball Cho giving his friends a huge hug. Did you ever think you'd see that? Flower petals fill the air as they kiss. We can only assume that those are "White Orchids"
And they kiss! That makes it official. 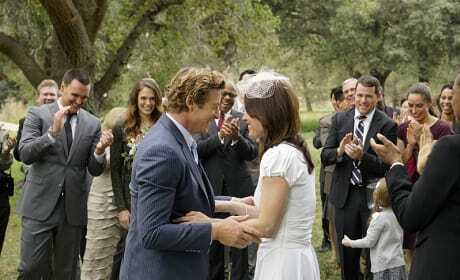 Patrick Jane and Teresa Lisbon are married. Yay! 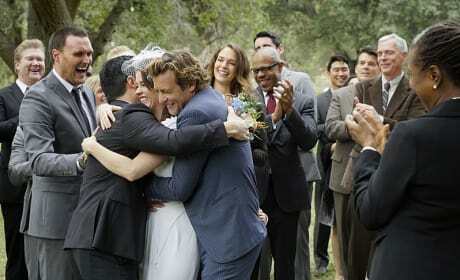 Rigsby and Grace both made it to the ceremony. Patrick must have put some planning into this to get them there. The veil is up. 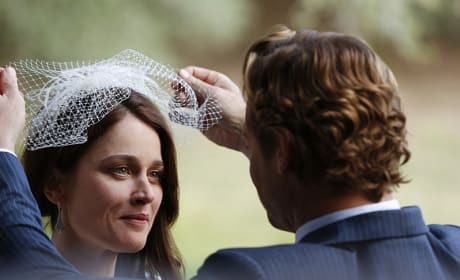 The wedding is on and Teresa Lisbon couldn't look any more in love. The look on Patrick's face makes it appear as though he's wondering if this is really happening. Teresa certainly makes a beautiful bride. Since Patrick surprised her with the proposal, we also wonder if he picked out the dress. 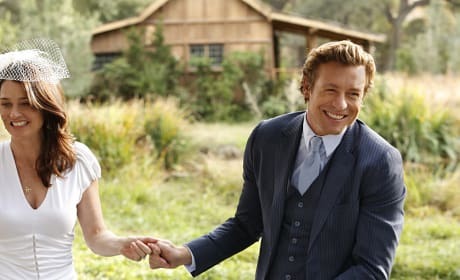 We don't think we've ever scene Patrick Jane look so very happy as he does right here. We wonder if this is what Jane had in mind when he first stumbled across this property, not just a retreat but a place to marry Lisbon. It certainly appears that Teresa accepts his proposal. At the very least we know she takes his arm. You look good. Orange suits you. Permalink: You look good. Orange suits you.